Medicomat-29 Computer System involves high-tech innovation projects of bio-informatics, electrical engineering and other sciences. Using the quantum resonance as the theoretical basis, it applies the advanced electronic equipment to collect the weak magnetic field of human cells for scientific analysis, thereby analyzing and determining the tested person's health status and main problems and putting forward standard prevention recommendations. It can issue very detailed 47 health reports. According to health status, it can give suggestion to improve health. Computer therapy and acupuncture provides the massage through the acupoints in projecting parts of body, readjusting the functions of the pathological organs. Fully Automatic Treatment - Auto-selection of acupuncture points on the ear, hand, foot and SPA - just put the electrodes and Medicomat will automatically find and treat all that is needed. The only action he or she needs to take is the adjustment of the intensity of the electrical impulse according to his or her tolerance. Package Includes: Main Machine x 1 piece + USB Cable x 1 piece + Test Rod x 1 piece + CD/USB Software x 1 piece + USB(Dongle/Key) x 1 piece + Ear electrode × 4 pairs + Hand Electrode × 1 pair + Shoe Pad × 1 pair + Electrode pads × 1 pair + Two-pin wire × 2 pieces + Machine-Computer USB-Wire x 1 piece + Aluminum case x 1 piece + User Manual × 1 copy. Health Check Analyzer System Medicomat-29 * In 5 Minute, It Can Know Your Body Health Status * Fully Automatic Treatment at Home - just put the ear hand foot electrodes and Medicomat will automatically works for the whole body. Prediction without symptoms * Speed and accuracy * Non-invasive and painless * Simple and convenient * It can issue very detailed 41 health reports, with 2 languages: English and Spanish on the same machine. According to health status, it can give suggestion to improve health. 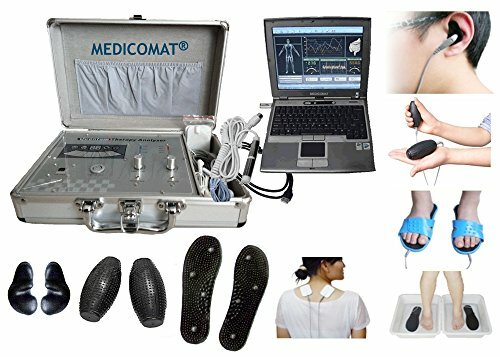 * Medicomat Health Computer System is extensively used in beauty salon, SPA club, clinics, health examination centre, health care products shop, direct selling, massage center, health center, etc.